Shampoo - Just Beauty Products, Inc.
Shampoo There are 18 products. Salerm Balancing Shampoo 250ml/9oz cleans hair deeply as well as removes all technical product residues applied before washing. 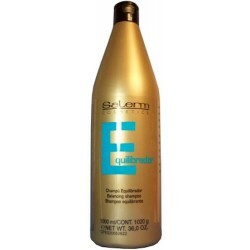 Salerm Balancing Shampoo 36 oz -Conditioner 34.6 oz Shampoo with tensioactive properties which cleans hair deeply as well as removes all technical product residues applied before washing. The conditioner is a formula rich in conditioning active agents which restore hair natural balance which have been damaged. Salerm Balancing Shampoo 1000ml/36oz cleans hair deeply as well as removes all technical product residues applied before washing. Salerm Balancing Shampoo 5100ml cleans hair deeply as well as removes all technical product residues applied before washing. Salerm Protein Balsam Conditioner 250 ml. / 8.6 Oz. Salerm Protein Balsam Conditioner 250 ml. / 8.6 Oz. Formula rich in conditioning active agents which restore hair natural balance which have been damaged by weather conditions (sun, wind, etc.) as well as consistent styling techniques. Salerm Protein Balsam Conditioner 500 ml. / 17.3 Oz. Salerm Protein Balsam Conditioner 500 ml. / 17.3 Oz.. Formula rich in conditioning active agents which restore hair natural balance which have been damaged by weather conditions (sun, wind, etc.) as well as consistent styling techniques. 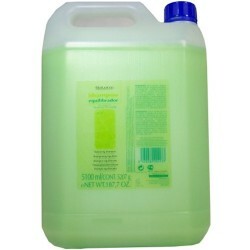 Salerm Protein Balsam Conditioner 1000 ml. / 34.6 Oz. 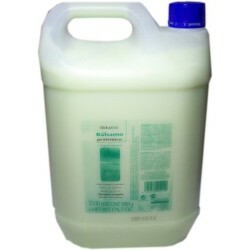 Salerm Protein Balsam Conditioner 1000 ml. / 34.6 Oz. Formula rich in conditioning active agents which restore hair natural balance which have been damaged by weather conditions (sun, wind, etc.) as well as consistent styling techniques. 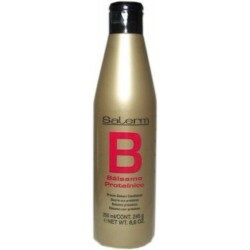 Salerm Protein Balsam Conditioner 5100 ml. 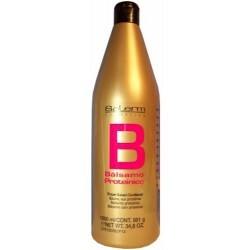 Salerm Protein Balsam Conditioner 5100 ml. Formula rich in conditioning active agents which restore hair natural balance which have been damaged by weather conditions (sun, wind, etc.) as well as consistent styling techniques. 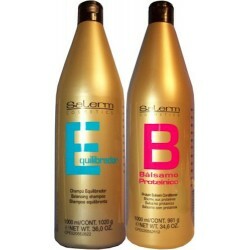 Salerm Nutrient Shampoo (Specific Falling Hair Shampoo) 9 Oz./250 ml It contains fruit vitamins. This shampoo uses tensioactive properties specially balanced to deeply cleanse and treat both skin and hair delicately. 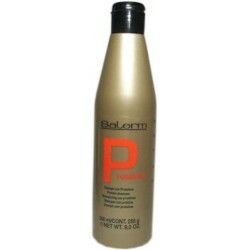 Salerm Protein Shampoo 9 Oz. / 250 ml Experience deep down hair hydration with this protein shampoo with a natural keratin base and a natural pH that acts effectively to restore dry hair,giving back body and shine. Perfect for chemically treated hair. 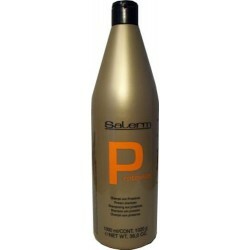 Salerm Protein Shampoo 18 Oz. / 500 ml Experience deep down hair hydration with this protein shampoo with a natural keratin base and a natural pH that acts effectively to restore dry hair,giving back body and shine. Perfect for chemically treated hair. 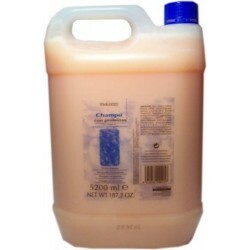 Salerm Protein Shampoo 36 Oz. / 1000 ml Experience deep down hair hydration with this protein shampoo with a natural keratin base and a natural pH that acts effectively to restore dry hair,giving back body and shine. Perfect for chemically treated hair. Salerm Protein Shampoo 5200 ml. 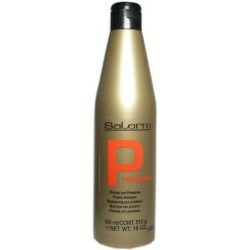 Salerm Protein Shampoo 5200 ml. 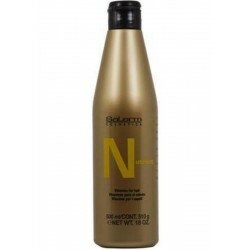 Experience deep down hair hydration with this protein shampoo with a natural keratin base and a natural pH that acts effectively to restore dry hair,giving back body and shine. Perfect for chemically treated hair. 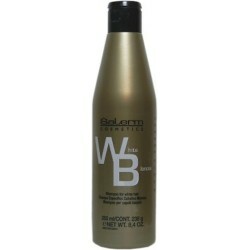 Salerm Shampoo For White Hair 8.4 Oz. 250 ml. Salerm Shampoo For White Hair 8.4 Oz. 250 ml. Shampoo formulated to remove yellowish tones of white hair from the very first application, restoring its sheen and gloss. 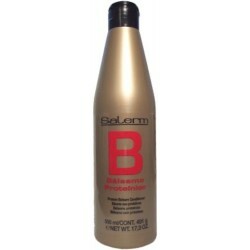 Salerm Specific Oily Hair Shampoo 9 Oz. 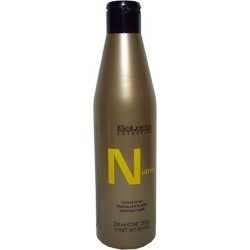 / 250ml A treatment shampoo specially formulated for oily hair. It contains natural Nasturtium extract. 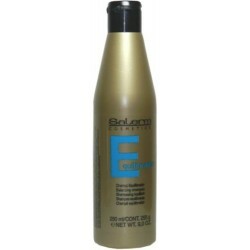 Salerm Specific Oily Hair Shampoo 18 Oz. / 500ml A treatment shampoo specially formulated for oily hair. It contains natural Nasturtium extract. 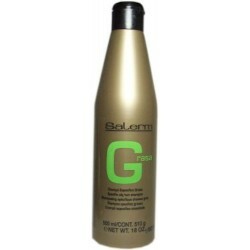 Salerm Nutrient Shampoo (Specific Falling Hair Shampoo) 18oz/500ml It contains fruit vitamins. This shampoo uses tensioactive properties specially balanced to deeply cleanse and treat both skin and hair delicately. Salerm Shampoo For White Hair 16 Oz. 500 ml. Salerm Shampoo For White Hair 16 Oz. 500 ml. Shampoo formulated to remove yellowish tones of white hair from the very first application, restoring its sheen and gloss.